I received so many emails when I posted the photo of Audrey's luscious Raspberry Chocolate Torte, that I decided to ask her if she would allow me to post the recipe. We are in luck, thanks Audrey! Place the chocolate chips in a medium bowl. Heat until the butter, sugar, preserves and raspberry liquid until boiling. Keep stirring until sugar is dissolved. Pour the mixture over the chocolate. Whisk until chocolate is melted and mixture is smooth. Keep whisking as you very slowly pour eggs into chocolate mixture. Pour batter into prepared pan. Trace and cut out parchment to fit bottom of a 9 inch springform pan and wrap pan with heavy duty aluminum foil all the way up the sides, using one big sheet. Place pan into roasting pan. Add boiling water into roasting pan until water comes halfway up sides of pan. Bake 45 minutes to one hour. Place on cooling rack. Rub thin blade knife around inside of pan to loosen torte. Cool, then chill over night. Heat all in small saucepan over low heat. Stir and make sure it does not boil or burn. Heat until smooth. Remove sides from pan. Cut a piece of cardboard to fit torte. Set on top, then invert torte. Place on pedestal. Slide knife between pan bottom and paper to release. Press lightly on cake to smooth out any uneven spots. Pour warm glaze over torte, letting it coat sides. Pour fast as it sets up quickly. If you want to decorate, let glaze set in fridge and then decorate. I melted Ghirardelli white chocolate and then drizzled it over the top and sides. Keep refrigerated! *Note she also included some of the reduced raspberry liquid and some fresh mint for a beautiful garnish. 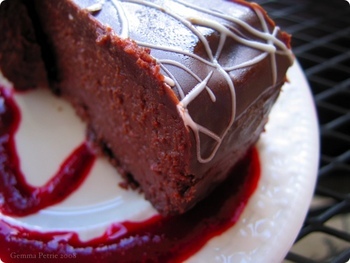 Oh man, that looks absolutely rich and moist ! Tortes are awesome due to the lack of flour and I haven't made one in months and months. I would probably use 1 cup of preserves instead of 1/2 raspberry liquid though. That'd be ok, right? I'm sure that would be fine. It is possible it would make the final product a bit less moist, but it would definitely be worth a try. wow. no doubt about it--that's the most moist cake i've ever seen. and since i happen to think that chocolate and raspberry are two of the most complementary flavors ever, i'm smitten. nicely done, and thanks audrey! Looks gorgeous, sounds delicious. Thanks for sharing. I think I'll have to try this sometime! This sounds wonderful! We have a large event coming up, do you think I could freeze The torte until a day or two before the event then thaw & glaze? Or even do the entire thing, glaze and all, and freeze? I think you could definitely freeze the torte for a day or two. I'm not sure about the glaze, but it would probably work.